Kenyans to create a justified rebellion if Elections will proceed. -Anyang' Nyong'o - Bana Kenya News, Real African Network Tubanane. The Kisumu Governor has talked to his people when he led demonstrations in Kisumu town saying the People will rebel the Move of the Jubilee government bulldozing unconstitutional activities. He said the people who will conduct elections are not to be blamed but they are doing so because of gun pointing. National Super Alliance (NASA) presidential candidate Raila Odinga who challenged the results won’t participate in the elections claiming the commission cannot conduct a credible poll as is currently constituted. “If the government subverts the sovereign will of the people ... then people are entitled to rebel against this government,” Anyang Nyong‘o told Reuters on Wednesday. The Demonstrations in Kisumu will always be there from today until next week as scheduled by the Kisumu county government. 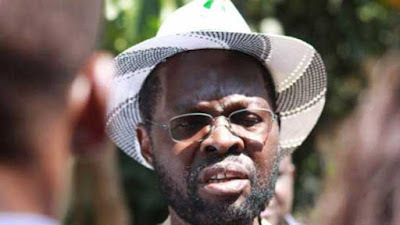 Prof Nyong'o is expected to hold another mega rally in Kisumu ahead of the polls tomorrow. Leave a comment here please. shocking trends of teachers and pupils suggest to each other for s3x in office and even in class rooms by sitting badly in Mombasa. "Lungula" A Man caught ontop of a goat in Kiambu by neighbours. How to add Meta tags in easy ways without adding to each post in Blogger for effective SEO and crawling. GET TO BANA FUNNY PORTAL. Bana kenya Gossips portal across all the internet. Get all exclusive latest gossips here today . Bana Sports Portal that provides latest sports news and bettings across the world of sports. Bana News Portal on political news and politicians themselves across the world. Read politics here local and international. Bana kenya Background and knowledge about the organisation of the enterprise. Copyright © Bana Kenya News, Real African Network Tubanane.